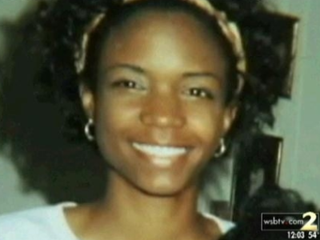 Stacey English is no longer among the countless number of African-American women who go missing each year without a trace. On Wednesday the police announced that they had identified the badly decomposed body of the bank employee, a month to the day since her family had last spoken with her. Her family stood in silence as Atlanta police Chief George Turner made the announcement to the media, according to the Atlanta Journal-Constitution. Still, it could be another month before investigators determine a cause of death. The initial autopsy of English's body did not reveal a cause of death, the Fulton County Medical Examiner's Office said Wednesday. No signs of trauma were found, Turner said, but that doesn't mean police have ruled out the possibility she met with foul play. English's body, discovered Monday in the divot of an uprooted tree off St. Johns Avenue near the Lakewood Amphitheatre, was in an advanced state of decomposition. Nearly a month earlier, her Volvo had been found, with the engine running, less than a mile away. Police conducted several searches of the surrounding area after English was reported missing Dec. 31, Turner said. On Jan. 6, K-9 units and officers on horseback were dispatched for the largest coordinated search for the woman but turned up no evidence. While some of English's relatives lament the amount of time it took to find her body, at least the police did not stop looking. So many cases of missing people of color fall off investigators' radars, even though African Americans, both men and women, make up one-third of all missing-person cases. We wish the family peace. Read more at the Atlanta Journal-Constitution.